Whether it is a Unit Substation or a standalone transformer, MGM has a solution for those hard to reach indoor installation locations. MGM’s Triplex Indoor VPI Transformers can help reduce or eliminate unnecessary site tear down and reconstruction to be able to fit a standard design transformer, thus reducing installation costs amounting to thousands of dollars. 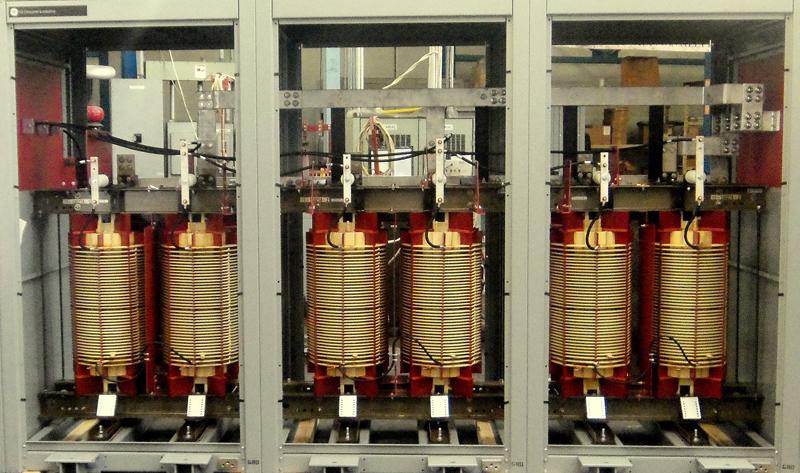 MGM’s Triplex Indoor VPI Transformers uses single-phase VPI transformer modules in a banked assembly. They can be customized to suit your application requirements and solve the challenges of hard to reach at indoor installation locations. The core and coil construction utilizes the same proven methods as our standard three-phase transformers. All units are factory pre-assembled and tested to guarantee proper fit and performance, and then they are disassembled for shipment. Our enclosures can be knocked down to further facilitate movement and allow them to fit through tighter spaces and areas with limited entry points. With MGM’s Triplex Indoor VPI Transformers there is no concern of liquid spills or need to build special liquid containments and/or vault type electrical rooms. Let us know about your special applications and we will provide a solution for you! Need it fast? We can deliver. Emergencies happen and we can expedite the manufacturing of your units to meet your delivery requirements. Ask about our Bull Rush program when you place your order and we can manufacture and ship your unit in as fast as 10 working days!